daily timewaster: Bye bye parking lot - the spot where I once parked my rental car is no more. Bye bye parking lot - the spot where I once parked my rental car is no more. 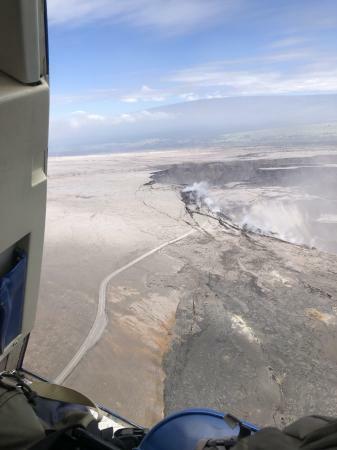 The once-popular parking lot (closed since 2008) that provided access to Halema‘uma‘u is no longer--the parking lot fell into the crater this past week as more and more of the Kīlauea Crater floor slides into Halema‘uma‘u. The Crater Rim Drive road (middle) now ends at Halema‘uma‘u instead of the parking lot. The view is toward the west-northwest. The Halema‘uma‘u experience has clearly changed since the last time you were in town. Maybe it's time for another visit? Well, at least you won't have to fight for a parking spot! For some reason, there aren't many tourists there this year.